Our columnist reports on the eagerly awaited tournament of the year and don’t miss the videos. The ongoing Zürich Chess Challenge event has been billed as the strongest tournament in history to date with a rating average of 2801. If you look at the list of participants, at least four names are missing, Kramnik, Svidler, Grischuk and Ivanchuk, not to mention Morozevich who does not belong to the top in terms of rating, but deserved his place here for having won here before. While this tournament may not be the strongest, it is a prelude to a greater event, the Candidates’ 2014 scheduled in March this year. On the positive side we have Carlsen’s first appearance in his new role as the world champion. I believe, he is here to gauge first hand, the form of his current rivals especially, Aronian and Nakamura. 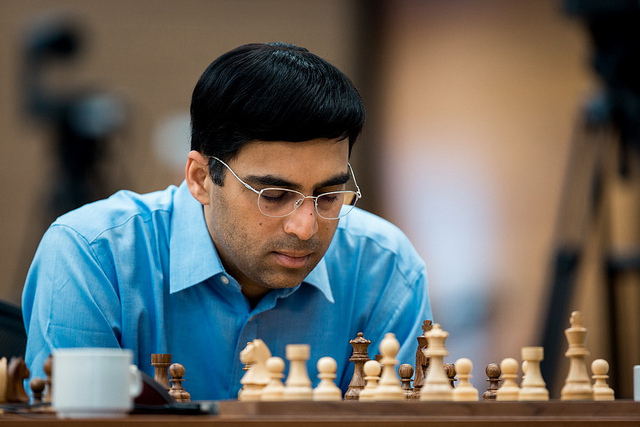 Going by his recent interviews he no longer sees Anand as a threat to the crown. He beat the former world champion in no more than 21 moves in the blitz (download pgn) preceding the main event. and in the second there followed a narrow escape from Gelfand. “I have almost never played as badly as I did in the beginning here. It was so bad that I could not even get mad. I just had to laugh. I was probably a bit rusty,” said Magnus. The turnaround came in his next encounter. He was outplayed Aronian (Levon won the recent Wijk-aan-Zee tournament and is in form-Ed.). Right when everyone expected Magnus to capitulate he fought back and saved the game. “It’s an amazing defence, he shows here. I cannot believe it” exclaimed Peter Leko. “I fought well from a hopeless position. 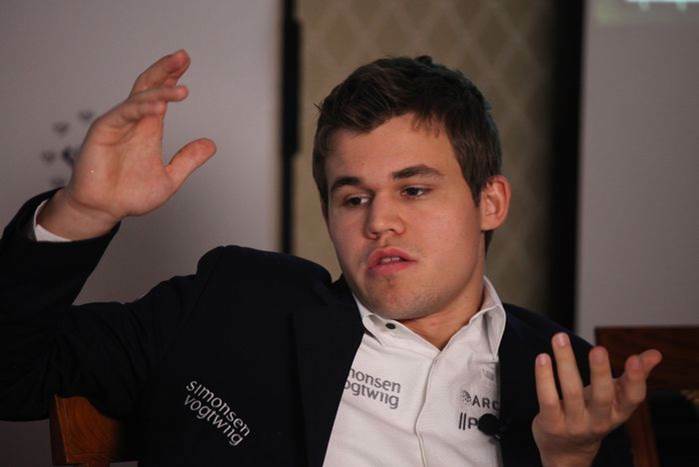 I am pleased that I managed to reverse the trend,” said a relieved Carlsen. Then followed the victories against Anand & Nakamura and he shared first place with Levon Aronian, earning him the right of white pieces. a)For more info. on the tournament, see the official site. b)Carlsen shares his thoughts on the ongoing event. c)Download all the blitz games of the event in pgn. Our thanks to all concerned for granting permission to use these materials. 1)Rapid tournaments are taken seriously since the days of Melody Amber. Blitz events are also important in terms of sporting performance.In the past it was Tal, Fischer and Anand. Now it’s Grischuk, Morozevich and Carlsen. These events need not be underestimated. 2)In 2013 Carlsen lost three games with regular time control. He was beaten by Ivanchuk and Svidler in the Candidates’. In the last round it was just touch and go between him and Kramnik. Carlsen qualified only on tie-break. After the Candidates’ he lost just one game with regular time control.That was with Caruana in Tal Memorial Tournament, June 2013. 3)The recent Zürich tournament was weaker with the absence of Kramnik, Ivanchuk and Svidler. Carlsen did well and two of his games with Gelfand and Nakamura would be shown here in due course. Chess at the highest level is not a one-man show. We need to retain a sense of balance and proportion in our assessment. As far as I remember he lost previous classical control game (or 2?) during Candidates, and it was an exceptional case. Before the Candidates he haven’t lost in ages. Carlsen could have won one move before with 20.Ne8+ in the blitz encounter with Anand. It’s mentioned in the notes to the game. In media interviews he mentioned that he was out of practice after the world championship match. In Zürich he had a lost position in quite a few games. But he managed to save most of them. He did lose 3 games, two against Caruana in Blitz & rapid and one against Aronian in Rapid. Loved the games against Anand, couldn’t he win one move earlier? Carlsen is superior always. I wonder how can this guy win literally EVERYTHING?